The United States is slowly climbing out of its recession, and calling the consumer credit crunch tight may be the understatement of the past two years. Many Americans cannot get financing for much needed purchases like new cars or to pay their bills. American small businesses, the backbone of the country’s consumer driven economy, must turn to other sources of financing when banks cannot fill the need. Pawnbrokers and pawn shops can fill that need and are still lending money to individuals and businesses during this economic crisis even when banks have long since stopped. Licensed, regulated pawnbrokers offer consumer loans that are secured by personal goods. Pawn shops provide safety net type of loans to approximately thirty million Americans, many who cannot secure financing any other way. The pawn system is fairly simple. A person brings in an item of value to the pawn shop and can either offer to sell it outright to the shop owner or pawn it. Traditionally, pawning an item means to borrow against the item while you leave the article as security for repayment of the loan. And, of course, there is interest charged and associated with the risk to the pawnbroker that you may never come back to claim your property. So, for example, if you have a $4,000 diamond ring, you may be able to pawn it at a pawn shop for $1,000. After receiving $1,000 in cash at the time of pawn, you may have approximately 90 days to reclaim your ring. You can receive your ring back when you repay your loan plus interest. If you never come back to reclaim your ring, the pawnbroker is free to sell the ring for a profit. According to the National Pawnbrokers Association trade group, Pawn customers tend to borrow a national average of only $80 for each loan and payoff the loan and redeem their collateral 80% of the time. Many pawnbrokers see many customers coming into their stores for small micro-bridge loans to get them over a hump financially. Pawning and purchasing items that have not been picked up after the required waiting period are extremely safe and profitable ways to borrow money and also to save on large purchases. The pawn industry is a heavily regulated provider of consumer financial services. In addition to state licensure requirements and laws concerning the terms and conditions of pawn loans, pawnbrokers are subject to thirteen different federal laws. Federal, state, and local laws govern every aspect of pawn transactions including interest rates, loan duration, redemption methods, record-keeping, and transaction reporting requirements. I was blown away that my wife has never even been inside a pawn shop let alone sell or buy anything from one. There are a lot of great deals to be had for a buyer. If you are in the market for new golf clubs, musical instruments, electric guitars, hand or power tools, collectables, sports memorabilia, firearms, electronics, and many other items, you can find some great items to buy at a huge discount. 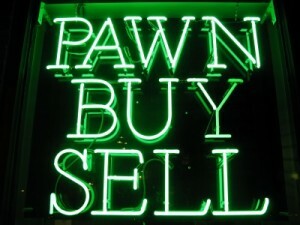 Recently, pawn shops have come into vogue with the 2008 recession and its lasting effects. Recently the History Channel has introduced a pawn shop television reality show that follows the lives of a shop owner and his family in Las Vegas as they epitomize the new breed of upscale pawnbrokers and their normal stable of everyday customers. “Pawn Stars” is a half hour show that chronicles the ‘Gold and Silver’ Pawn Shop in Las Vegas. The show’s primary characters are the patriarch, his son, and his grandson. Each half hour shows consists of three or four customers who bring in really odd or interesting items that usually have some kind of history behind them. No longer is pawning an item seen as a seedy act by a desperate clientele. Now it is taken on a larger role in the American economy thanks to the recession and can be a win-win situation for everyone. Previous post: What is a dividend reinvestment plan (DRIP)?